Scott Moore (@water_futures) is a leading expert on water policy and politics. Currently with the World Bank Group’s Water Global Practice, he focuses on helping client countries meet critical water resource management challenges, including water scarcity, pollution, and flooding. He is also a Senior Fellow at the University of Pennsylvania Water Center, where his research focuses on climate change and the water-energy nexus. As of August 2018, Scott will also become Director of China Programs and Associate Professor of Practice in the Study of Contemporary China at Penn. 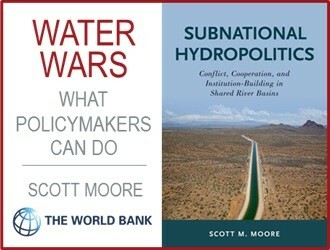 Scott’s forthcoming book from Oxford University Press, Subnational Hydropolitics, explains how and why sub-national as well as national governments often fight over water – and how they can be encouraged to cooperate instead. His academic research and commentary on the world’s water crisis has been featured in leading publications including Nature, Foreign Affairs, and The New York Times. Scott holds master’s and doctoral degrees from Oxford University, where he was a Rhodes Scholar, and an undergraduate degree from Princeton. 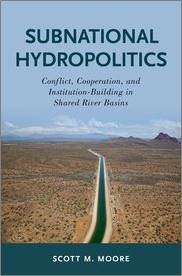 The newly-published Subnational Hydropolitics: Conflict, Cooperation, and Institution-Building in Shared River Basins examines in-depth case studies of both conflict and cooperation at the subnational level in four countries: the United States, India, China, and France. In particular, the book looks at the causes of conflict over water within countries instead of between them — and finds that, contrary to popular belief, conflict doesn’t usually happen because of water scarcity or shortage, but rather institutional failures. China Water Risk had the opportunity to sit down with the author Scott Moore, a leading expert on water policy and politics, to find out more. Plus, also check out Moore’s views on solving the global water crisis here. China Water Risk (CWR): Congratulations on the publication of your new book “Subnational Hydropolitics: Conflict, Cooperation, and Institution-Building in Shared River Basins”. What we find interesting is how it looks at causes of conflicts over water within countries instead of between them. Could you briefly explain why this is important? Scott Moore (SM): While many people are concerned that climate change and other pressures may lead countries to fight over water, in reality international water conflict is exceptionally rare. Political, economic, and violent conflict between sub-national groups, however, is increasingly prevalent. In the United States, the Supreme Court will this year hear not one but two inter-state water disputes on the same day, while in India riots over the sharing of water between two states shut down India’s vibrant IT industry last year. As I explore in the book, these types of subnational conflict over water demand attention and action from policymakers. CWR: This is certainly a topic that needs more awareness. So, what are the key drivers of subnational water conflicts? SM: Many people assume that water conflict is a function of scarcity: when there’s too little to go around, people are more likely to fight over it. But my research shows that’s not necessarily true. Instead, subnational conflict happens when shared water resources become linked to identity politics. Water can quickly become a touchstone for a range of tensions over language, ethnicity, culture, and religion. When this happens, water can be the source of prolonged conflict and dispute. Fortunately, my research also shows that even long-running water conflicts can be ended when outside groups, including national leaders, research institutions, and NGOs, work together to build institutions at the watershed and river basin level. These institutions provide a platform above the political fray to help users of a common water resource make consensus-based, cooperative decisions that can make water use not only less contentious, but also more sustainable. CWR: Cooperation is clearly important for preventing and solving such conflicts. Are there any best practices or success stories of this so far? SM: Cooperation is definitely key, but in my mind the most important thing is how you try to institutionalise cooperation and design institutions to best promote cooperation. France offers perhaps the best example. Since the 1960s the country has used bodies known as Water Agencies to make decisions over how water is used and financed. These bodies have what are in my opinion two key features. First, they are participatory and inclusive, meaning they are broadly representative—they include 25% civil society representatives on the decision-making committees, known as basin committees, with 50% of all representatives being elected by water users within each river basin. This type of representation helps to ensure decisions are legitimate and accepted by water users. Second, the Water Agencies have high capacity. They have substantial powers to raise revenue and determine expenditures, and are supported by expert scientific committees that can help ensure decisions are well-informed and reflect environmental as well as other concerns. This capacity and level of resources goes a long way to addressing the full range of issues that can cause conflicts among water users. CWR: You also examined China as a case study in the book. Could you outline how conflicts and cooperation over water have unfolded there specifically? SM: China’s domestic water conflicts typically take the form of disputes between sub-national units like provinces and prefectures. These conflicts arise over a number of issues like dam and hydropower development, but they most commonly pertain to some form of inter-jurisdictional water pollution. Domestic water conflicts can provoke civil unrest. In a landmark incident in 2001, residents of the city of Jiaxing in Zhejiang province who were fed up with pollution flowing downstream from neighbouring Jiangsu province sunk a number of old boats in the two provinces’ shared waterway to form a makeshift dam, which backed up the polluted water across the border. China’s internal water wars have the potential to pose significant problems for China’s political system, which is set up to ensure local officials pursue centrally formulated priorities rather than their own. There are relatively few mechanisms to encourage cooperation between neighbouring jurisdictions on issues of shared concern. Beijing has recently undertaken a number of wide-ranging reforms intended to address the problem of inter-jurisdictional water disputes. A number of regulations have been issued over the past decade to clarify how such disputes are handled, and several provinces have set up ‘dialogue mechanisms’ to try to prevent and resolve such disputes. But the overwhelming preference of China’s leaders is for a more hierarchical solution, such as the recently established ‘river and lake chief’ system (hezhang). Under this system, China’s local officials are vested with specific responsibilities for ensuring adherence to water quality and other water-related policy measures within their jurisdictions. A key question is whether and to what extent China’s domestic water conflicts affect or influence its sometimes-contentious positions with respect to international transboundary waterways. My research hasn’t uncovered any direct links, but as I’ve written about previously, I suspect that inter-jurisdictional conflict plays some part in the concerns of China’s downstream neighbours, if for no other reason that competition between local governments seems to play some role in encouraging construction of dams and other infrastructure, which often underpins the concerns of downstream riparians. CWR: Lastly, what would you suggest as steps that policymakers can take to prevent and resolve subnational water conflicts? SM: Firstly, policymakers have to take local politics seriously. There’s a long-standing tendency on the part of water specialists, national governments, and multilateral institutions to focus on international rather than subnational relations. But this book shows that local politics drives conflict and cooperation over water more so than at the international level. Governments, multilateral institutions, and researchers should devote just as much attention to preventing water conflict at the subnational level as they do at the international level. Secondly, policymakers can encourage the involvement of outside groups. Given the political sensitivity of water issues, officials are often hesitant to engage outside groups, including NGOs and multilateral institutions. But these groups provide valuable resources and perspective, and often the right motivation to form institutions that can prevent and resolve water conflicts. Passing laws giving NGOs and other plays the right to provide input on water decision-making is a good starting point. Thirdly, inclusive structures for water governance need to be established. Good water governance is hard, but the best way to achieve it is to create institutions at local, regional, and national levels that bring different stakeholders together. France’s Water Agencies, for example, include farmers, factory owners, and everyday citizens alongside government officials, and this form of inclusion helps keep nascent conflicts in the boardroom rather than the courtroom or, worse, on the streets. Fourth, water users with good data and expertise should be supported. Inclusion should be balanced with expertise. While France’s Water Agencies are governed by inclusive councils, they also include substantial in-house data collection and scientific expertise. This capacity helps non-water specialists make better, more locally-appropriate, and more sustainable decisions. Lastly, leadership is key. At the end of the day, the most powerful means of preventing and ending water conflicts comes from good, engaged leadership. My research shows that national leaders are often reluctant to become involved in local or regional water conflicts; after all, it’s usually a thankless task. But when they do so, as U.S. officials have done in the Colorado River basin over the past 25 years, national leaders can play a powerful role in bringing parties to the table, and brokering consensus. Ending water wars makes for a powerful political legacy. Why Do Hydro-Hegemons Cooperate? – Cooperation and conflict exist on a spectrum in transboundary river basins. Dr Selina Ho from Lee Kuan Yew School of Public Policy explores the policies of China & India, Asia’s two hydro-hegemons. How and why they work with other states on the Mekong & the Ganges? Avoiding Hydro Wars: With up to 124GW of planned hydropower on China’s transboundary rivers, no wonder regional geopolitical tensions over water is running high. Debra Tan gives the low down on China’s hydropower expansion, are there other options to avoid sparking hydro wars?